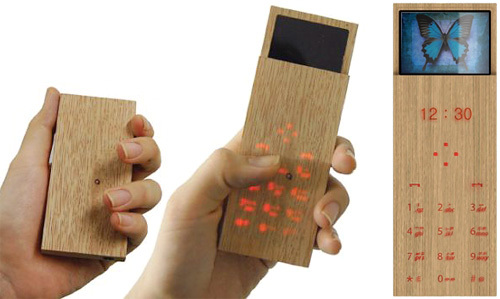 Maple Wooden Phone Might Appeal To Amish Teens | OhGizmo! By Andrew Liszewski on 08/04/08 • Leave a comment! I know the Amish are anti-technology and all, but I can only assume there has to be a handful of teenagers in every village who would be willing to bend the rules for a cellphone. And while the Maple Phone really wasn’t created to be Amish-friendly, I think the fact that it looks like a block of wood when not in use would help someone who’s not suppose to have a phone keep it a secret. In reality the Maple Phone concept was designed by Hyun Jin Yoon and Eun Hak Lee to not only look stylish, but also be potentially cheaper to mass produce. The phone features a sliding mechanism that keeps the screen hidden when not in use, and the touch sensitive keypad uses a backlight that’s visible right through the wood finish. Best of all you can customize the phone’s appearance with nothing but a switch-blade, a rocking chair and an afternoon of whittlin’. ← A Gift From Tech Heaven: Gadget Vending Machines!